Mustaches are a blast, but they can be a huge responsibility if you aren't prepared! You have to clean, feed, and groom your mustache like it's a fussy show dog, and they need to be taken on regular walks. But, if you are ready to take on this monumental task, a sweet 'stache can elevate your look in ways that can't be achieved by other means. A horseshoe-style mustache can make you look tougher, and a well groomed chevron-style mustache will instantly make you look like a cop. They are very powerful things, these mustaches! 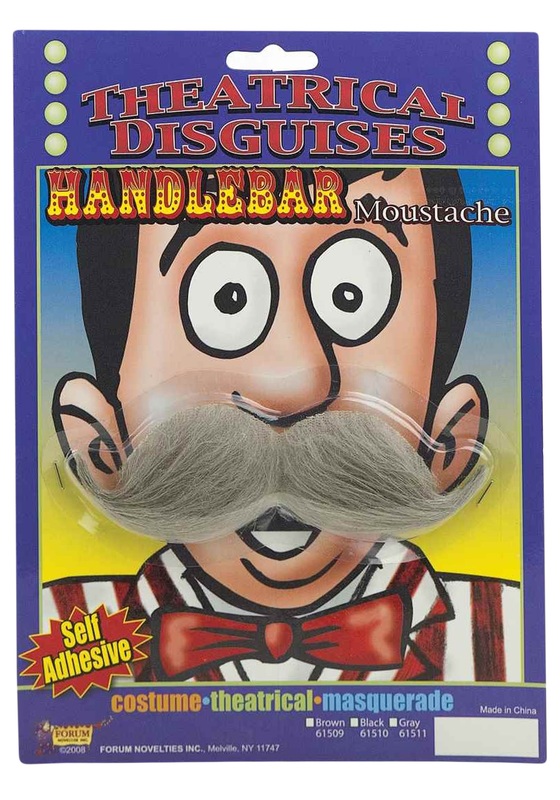 Next time you want to add some dapper flair to your costume, slap on one of these Grey Handlebar Mustache! This lip warmer looks like the real deal, but it is just synthetic hair, so no barbershop quartets were shorn for you to get this look. Enjoy being instantly transformed into a southern gentleman or old-timey captain of industry. Or, just have fun making all of your friends envious of your curly whiskers!